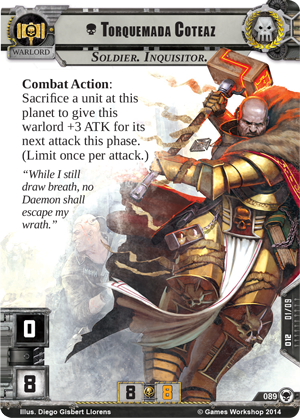 The Threat Beyond, the fifth War Pack in the Warlord cycle for Warhammer 40,000: Conquest is now at The Wandering Dragon! The power of the Inquisition stands against dark heresies throughout the Traxis sector, but new cards for every faction also continue the cycle’s main themes, granting more significance to your warlords and how you to choose to use them every turn. With this War Pack, you can fight alongside the Salamanders legion of Space Marines, lead a vicious attack with the Orks, or turn to the excess of Slaanesh with the Chaos faction. The Wargear of the Dark Eldar is yours to command, as are the deadly wraithknights of the Eldar, or the grenadiers of the Tau. 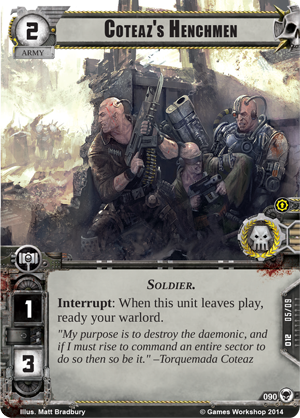 Every faction gains new cards as they struggle to conquer the Traxis sector. With the introduction of The Threat Beyond, Torquemada Coteaz (The Threat Beyond, 89) offers you a number of distinct advantages, breaking away from standards set by other warlords and forging his own path to victory. Torquemada Coteaz allows you to start the game with both eight cards and eight resources, whereas most other warlords provide seven of each. This extra advantage may seem small, but the options that it brings you can easily shape the entire game. Torquemada Coteaz also bears eight HP on his hale side, more than any other warlord. These bonuses come at a cost, however: Torquemada Coteaz has an ATK of zero. Even here, however, Torquemada Coteaz’s resourcefulness can increase his prowess in battle. He bears a Combat Action that reads, “Sacrifice a unit at this planet to give this warlord +3 ATK for its next attack this phase. (Limit once per attack. )” By drawing upon the nigh-limitless manpower of the Astra Militarum, including token units like theGuardsman, Torquemada Coteaz can easily strike for more damage than any other warlord. The units in Torquemada Coteaz’s signature squad live to serve him in battle and enhance his power. The signature squad includes four copies of Coteaz’s Henchmen (The Threat Beyond, 90). This unit can engage in battle on its own, but perhaps its most useful purpose is to support Torquemada Coteaz. Coteaz’s Henchmen has an Interrupt that allows you to ready your warlord when this unit leaves play. Because of this, you can attack with Coteaz’s Henchmen and then sacrifice the Henchmen to ready Coteaz and boost his attack, allowing him to rain the fury of the Inquisition down on his foes. 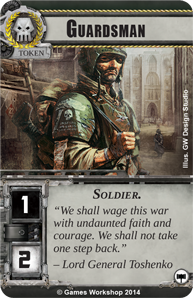 Expendable Guardsman token units may be ideally suited to fuel Torquemada Coteaz, but they may not always be present when you need to boost Torquemada Coteaz’s attack. Thankfully, that’s where some of the other cards in the signature squad come in. 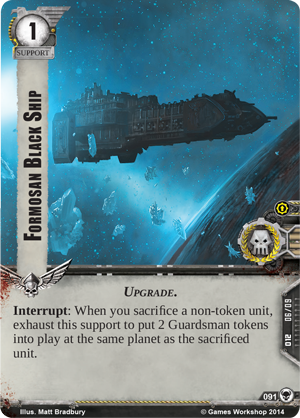 You’ll gain access to a new support, theFormosan Black Ship (The Threat Beyond, 91), which allows you to put two Guardsman token units into play when you sacrifice a non-token unit, giving you more fodder to fling at the enemies of the Imperium. 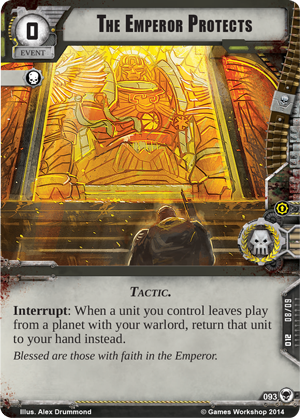 You may also choose to use The Emperor Protects (The Threat Beyond, 93) to save your sacrificed units. By playing this free event when one of your units leaves play from your warlord’s planet, you can return that unit to your hand instead, allowing you to redeploy the unit and continue the onslaught of Torquemada Coteaz and the Astra Militarum. 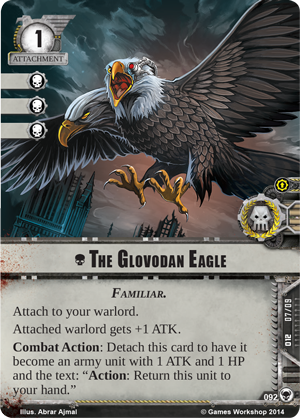 The final card in the signature squad is The Glovodan Eagle (The Threat Beyond, 92). This card is an attachment that can only be attached to your warlord, giving him a permanently raised ATK. Obviously, this can be crucial for giving Torquemada a means to attack even when you don’t have units to sacrifice. However, you can also detach this attachment from your warlord, causing it to become a unit with one ATK and one HP, allowing you to deal more damage after your opponent’s units are exhausted. Then, you can sacrifice it to boost Torquemada Coteaz’s damage. Alternatively, you can take an Action to return this unit to your hand, allowing you to redeploy it next round or use it as a shield card to block up to three damage. The Glovodan Eagle offers an unprecedented amount of versatility, allowing you to command the forces of the Astra Militarum in the best possible way. Darkness stirs among the stars and planets of the Traxis sector, and only the vigilance of the Inquisition can root out corruption and bring this new sector into the fold of the Imperium. Confront the darkest servants of Chaos in The Threat Beyond and stand triumphant with Torquemada Coteaz! The Threat Beyond is now at The Wandering Dragon!